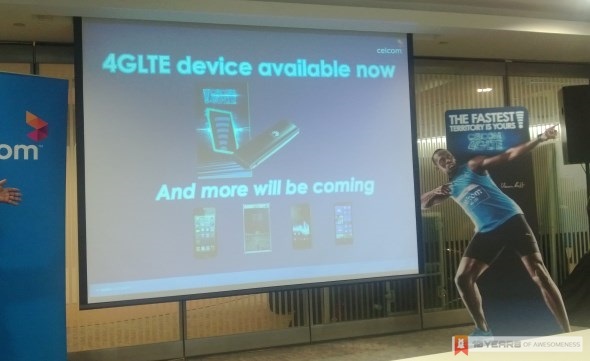 As reported yesterday, Celcom is officially rolling out its 4G LTE network to consumer today but is limited to data-only usage via a USB dongle. That being said, the telco revealed that they do have plans to enable their LTE for smartphones which is shown through this slide during the company’s on-going 4G LTE media presentation at its HQ right now. Among the smartphones that Celcom listed in its presentation are Apple iPhone 5, Samsung Galaxy S4, Sony Xperia Z and Nokia Lumia 920. The company has also revealed that they are hopeful to roll out LTE support for iPhone 5 on 18 May 2013 which is also the actual commercial launch date for the service. They will also support tablets soon but no other dates have been mentioned at today’s media presentation apart from the Apple iPhone 5. Through this revelation, we now pretty much know two things right now: first being that Celcom will also be utilizing 1800MHz spectrum for its LTE network and second, this a huge sign that Samsung Galaxy S4 with LTE – which runs on Qualcomm Snapdragon chipset rather than Samsung’s own Exynos – is heading to Malaysia.